Home » I.T. 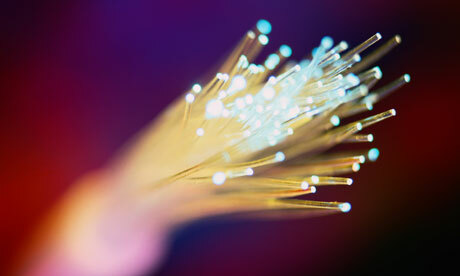 » How do Fibre Optics Transfer Data? Fibre optics represents an evolutionary leap in the speed and bandwidth capacity of telecommunications systems. Copper cable, once the standard for phone lines, can transmit a few million electrical signals per second, while fibre can handle a staggering 20 billion light pulses per second. To understand how fibre optic cables work, think of them as long tubes with mirrored walls. If you were to shine a laser pointer into the tube at a slight angle, the laser beam would bounce its way down the tube, reflecting off the mirrored walls until it reached the end. Instead of using mirrors, the walls of fibre optic cable are made of two concentric layers of silica glass called the core and cladding. Cladding has a lower refractive index than the core, causing a phenomenon called total internal reflection. When light strikes the cladding at a low enough angle, it is reflected back into the core without losing any energy. 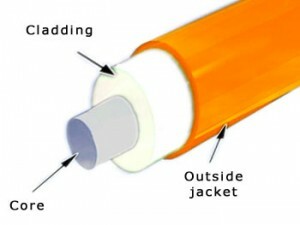 There are two major types of fibre optic cables: singlemode and multi-mode. Single mode fibre has the narrowest core – a tenth of the diameter of a human hair – and uses a powerful laser to send data long distances. Multi-mode fibre has a wider core with room to bounce around many simultaneous signals. Multi-mode fibre uses weaker (and much less expensive) LED lights and is better suited for short runs like local computer networks. Modern fiber optic cables can carry a signal quite a distance — perhaps 60 miles (100 km). On a long distance line, there is an equipment hut every 40 to 60 miles. The hut contains equipment that picks up and retransmits the signal down the next segment at full strength. Valentine Conundrums : Why Does an X Stand for a Kiss? and Why Do Humans Kiss? Does any other Animal ‘Speak’ or Communicate like Humans?